Yahoo! announced today that consumers can go to Yahoo! 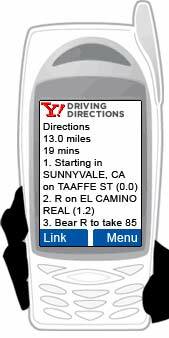 Maps and click the “Send to Phone” link on the driving directions page to send the full, step-by-step directions directly to their phone. After sending the driving directions to their phone, consumers receive a message with a link taking them directly to the full turn-by-turn driving directions. This new functionally builds on the successful implementation of the “Send to Phone” feature in Yahoo! Local for contact information and addresses for local businesses, as well as the launch of Yahoo! Search for Mobile across several major U.S. carriers late last year. This new service is available across most major wireless carriers - Cingular/AT&T Wireless, Sprint/Nextel and T-Mobile, at no charge for consumers. However, carriers may charge fees based on consumers’ data plans. More info on how the service works is here. It will be interesting to se if they ever are able to get this working on Verizon. Naw, VZW is more likely to strike up an exclusive deal with Yahoo to get it onto their phones at a staggeringly expensive "VDirections" or some such nonsense. VZW are getting greedier by the day, especially in regards to anything data-related on their network. I mean, have you SEEN the VCAST prices? *GAG*! Must have a couple of bugs in the works yet. Without WAP service, this is useless. Even with WAP service, I can't "click" the URL to open a web browser on my phone. I don't understand how hard it is to send the directions as a text message (or a series of messages). New method to send directions via sms.